It was all very pretty and made for a befitting ending to a fashion week that's been replete with trendsetting moments. Hosting its 20th consecutive fashion week, the PFDC is running strong. There was plenty of energy in the air. There usually is on the last day of fashion week in Pakistan. For one, designer lineups for the last day usually feature big fashion names – although this doesn’t ring true for the PFDC Sunsilk Fashion Week (PSFW) this time with some genuinely good collections showcased on every single day. Also, for the designers and the media constantly in attendance, the good cheer usually stems from a sense of relief that the back to back shows are finally coming to an end. 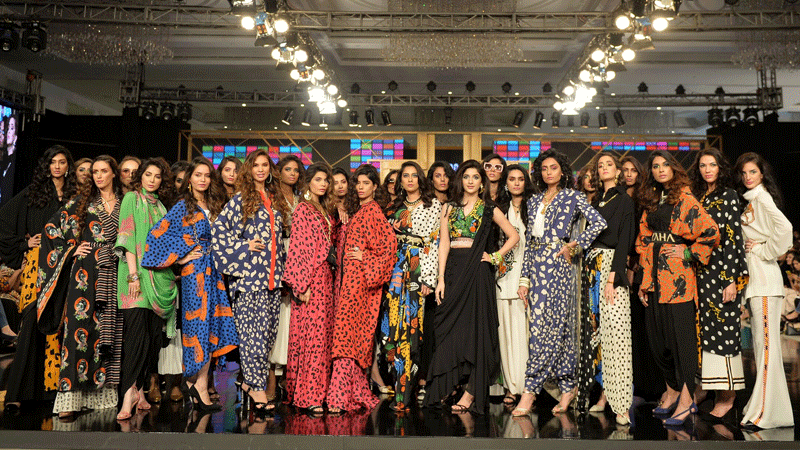 A three – or worse, four – day long omnibus can be draining except that it wasn’t quite as much this time around at PSFW. Perhaps the energy in the air was simply derived from the fashion highs that featured on the runway throughout fashion week. In an industry teeming with copycats and mediocre aesthetics, this is not an easy feat to achieve. But the Pakistan Fashion Design Council (PFDC) pulled out the punches just fine. The early evening, dedicated to the high street and newcomers, showcased collections by Khaas, Sanoor, Almirah and So Kamal. It is testament to the power of a fashion week platform when retail-centric brands create collections and pay to be part of it. However, it seems like such a waste of time, effort and money when these brands try to delve away from their signatures – which tend to usually be textile and traditional-wear – and attempt to create anglicized apparel just for their fashion show. It would make so much more sense if they tried to innovate within their strengths. 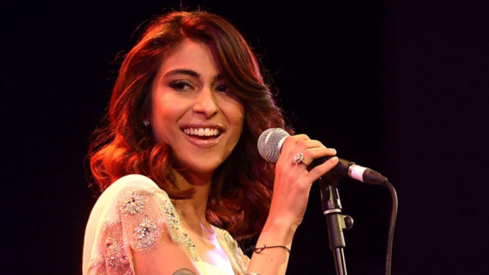 Some of the best high-street brands in the market – Generation and Khaadi come to mind – do this. Why can’t all the rest of the gown-lovin’ high street crowd follow suit? Having said this, seen from a retail friendly perspective, Almirah’s formal menswear had its redeeming moments: the monochrome whites and blacks and the splash of red thrown in here and there. Very subtle, urbane and quite sellable. Moving on to the evening’s events, two fashion favorites began and ended the third of day of PSFW – Khadijah Shah and HSY respectively. Interspersed in between were two more heavyweight veteran brands: Nomi Ansari and Republic by Omar Farooq. With all these enticing ingredients lined up, all the PFDC had to do was whisk them together and roll them out on to the runway. But just like you can’t judge a book by its cover, you can’t draw conclusions about a lineup simply because it boasts huge designer names. Here’s the lowdown. There were big leafy tropical plants, leopards, bright yellow frogs, monkeys and polka dots! Khadijah Shah always likes to shake things up and with the debut show of her fledgling high-street label ‘Zaha’, she reinvented the wheel and spun pret into an all-new direction. Ready-to-wear in Pakistan may be floating along in a floral and pretty pastel bubble but within Zaha, it was a funky, bold, wild explosion. If you had been thinking that prints were passé, you simply had to rethink the notion. Prints like these? I am guessing that they’re going to become quite the rage. And with an eye on the high-street, the designer kept the silhouettes wearable: glamorous 80’s-esque white dresses and breezy baggy tunics nipped at the waist with sashes, paired with harems and shalwars. The styling was very groovy too: chunky accessories, big, glossy hair and neon eye makeup. The young and pretty Mawra Hocane as showstopper fitted right in. The great thing is that the collection will be available for retail very soon. Fashion forward yet wearable, high street’s placid waters just got injected with a new kind of cool. Speaking of cool, Nomi Ansari’s athletic wear show in collaboration with sportswear brand Tuhura was it. The models came in jogging, feinting boxing moves, twirling a ball and bouncing it into the air. For the final walk, they ran down the runway and danced while Nomi and his showstopper, the svelte Hania Aamir, walked out. There was some great looking workout wear: track suits, sweatpants, racerbacks and sports bras in animal prints, neons and shades of monochrome. The collection will be retailing online on Tuhura’s website in another week or so. That’s good news for the fitness-conscious who like to look good while they are sweating it out. Nevertheless, it wasn’t really the stuff of fashion weeks. The fit, colors and textures were just right but there was nothing memorable or remarkable about the collection. 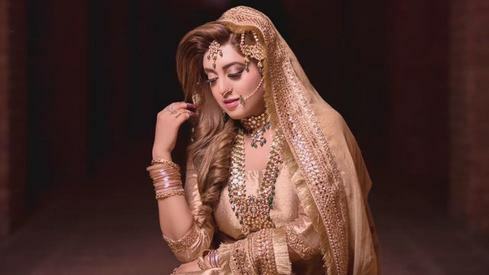 And the thing is, one always expects Nomi Ansari to churn out designs that are memorable and remarkable. This was designer Omar Farooq flexing his muscles and telling the world that while other men’s designers may churn out multicolored sherwanis as ‘fashion’, he still had a finger on the pulse of fashion-forward menswear. Taking inspiration from the evolution of symbols over the annals of time, the designer mixed pops of neon within a restrained palette of beiges, browns and whites. There were slouchy jackets and more fitted ones, shirts, light hoodies, scarves and on-trend cross body bags. 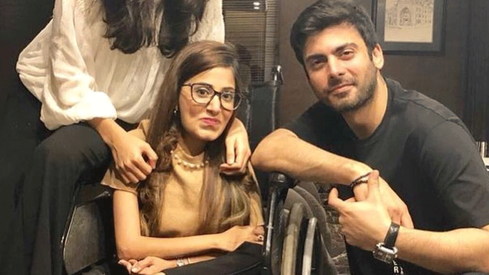 Text and symbols were etched across them, ciphers that hold personal meanings for the designer: a tousle-haired young boy, a monster glaring out from the back of model Aimal Khan’s jacket and rebellious slogans that declared ‘not a role model’. Occasional dashes of neon yellow and shiny holographic plastic flashed down the catwalk, options purely for the more adventurous. The finish was impeccable and the mixing and matching of layers and textures was so very well-conceived. Absolute statement-wear for men – we need more of these please, Omar Farooq! Then came the finale by HSY, dedicated to his mother, and need I say that it started off with a dramatic opening where lights flashed and thunderous music played out? That always is the case with an HSY show. The designer is a pro at theatrics and he knows how to make an entrance that has the audience craning its neck and phone cameras clicking away. But what held center stage in HSY’s ‘Rani’ was a single dominating hue: a deep red. Refraining from over-embellishment, the clothes were a play of textures and silhouettes. Long tassels swung down to the floor and fitted blouses peeped out from under translucent georgettes that floated in a range of capes, gowns and structured tunics. It was all very pretty and made for a befitting ending to a fashion week that has been replete with so many trendsetting moments. 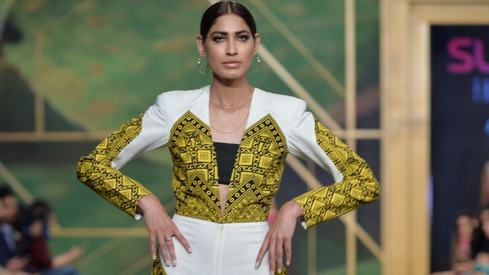 Three days ago, PSFW had pirouetted to a lilting start with the old-world tunes of Zara Shahjahan’s Eastern apparel and it wrapped up with HSY’s cardinal parade. 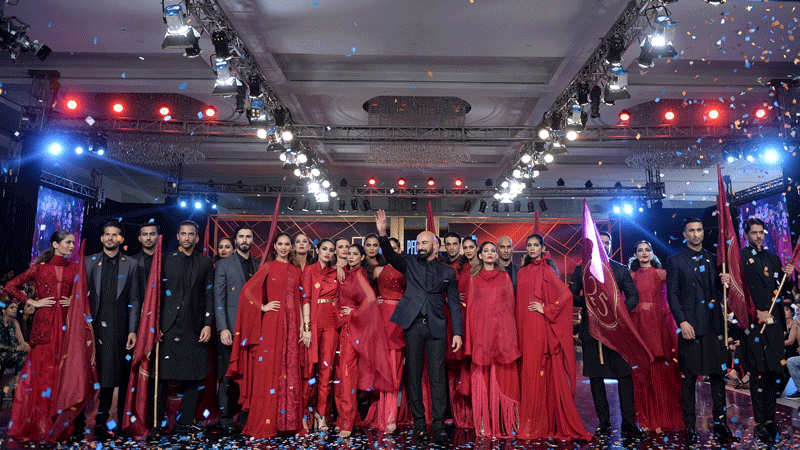 Hosting its 20th consecutive fashion week, the PFDC is running strong. May the show go on. What happens when a style novice goes to fashion week for the first time? What is PFDC, HSY etc, etc. why use them? Khadijah Shah definitely the better of them all. No doubt. Good effort! I always wonder where are the outfits' concepts for regular wear? Why there is not a show for a regular man? We (The people), more than 80% of the world, for how long would be neglected as a minority, just because it's all about money? I see a deep opportunity, who wanna take it?